One of my major projects for the summer was to create a world class media space for the Ultimate Bachelor Pad for Esquire Magazine. We produced a documentary about he build process for DIY Network that is scheduled to air in early January but you can see the house in this month's edition of Esquire, as well as on the Esquire site, and Facebook page. The room started life as 2 children's bedrooms and 2 small bathrooms. Some serious demolition and the addition of some new structural steel left us with a sort of trapezoid shaped room to turn into the Ultimate Bachelor's Ultimate Media Room. The layout is dominated by one of the most unique elements of the room, a 16 foot wide turntable that allows the entire seating area to rotate between the screening wall and video gaming area. While the room rotates, the room lighting fades, and animated "chase" is triggered in the RGB LED uplights surrounding the edge of the room, and the TVs in the gaming area raise or lower from their cabinet. If the window shades are open, they also close to allow glare free viewing. The turntable is powered by an electric motor that engages a curved aluminium track on the tables edge. 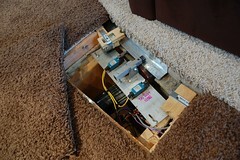 The track runs below the carpeted subfloor and is driven by a pinch roller design. A trigger switch is activated by 2 dimples welded onto the ends of the track. A micro-controller recognises the pulse from the limit switches to ease the table to a stop before reaching the hard stops that prevent guests from manually turning the table completely around. The effect of the rotating room is accentuated with an animated lighting chase and color change that coincides with the position of the room. 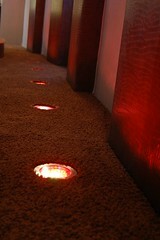 The color changing LEDs are controlled via DMX by a Daslight DVC2 GOLD ZM* stand alone control interface. The contact closure triggering capability of the ZM unit makes it wasy to integrate with the Crestron master controller. The Daslight drives three DMX 24v LED drivers that each control 4 fixtures. In operation, it became apparent that a cooling system would be necessary for the motor box in the subfloor. The spare channel of the LED drivers controls a 24volt squirrel cage fan to keep the motor happy.